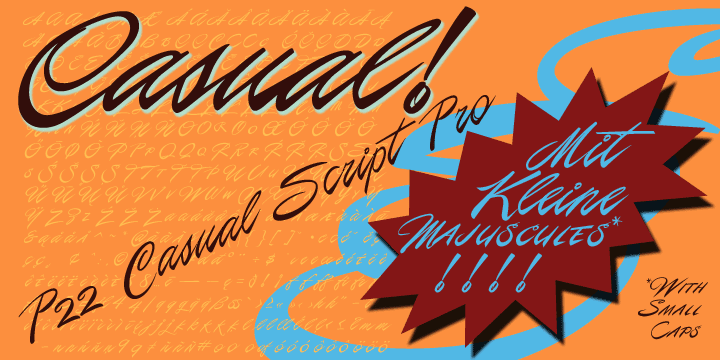 P22 Casual Script Pro, designed by Richard Kegler, is a flexible OpenType font based on mid-20th Century hand drawn advertising lettering scripts. As an alternate to thicker casual script styles, this free-flowing thin brush style is evocative of vintage product advertisements and packaging lettering and is highly suitable for a retro flavor. The Pro font includes over 500 glyphs with at least 2 of all upper and lower case characters with OpenType scripting and ligatures for a more natural and random effect. There is also a unique feature not found in other script fonts: Small Caps! While it may seem unnatural for a script font to have small caps, these work well as an authentic variation of brush script lettering for advertising. Also included in the Pro version is a full Central European character set, swash characters and more. The Pro font package includes one Pro OpenType font and 3 single, basic OpenType fonts- Regular, Alternate and Small Caps, for use with applications that do not support OpenType features. Now through June 30th, the Pro package is available at the introductory price of $31.95 (reg $39.95). All basic single styles are $19.95.